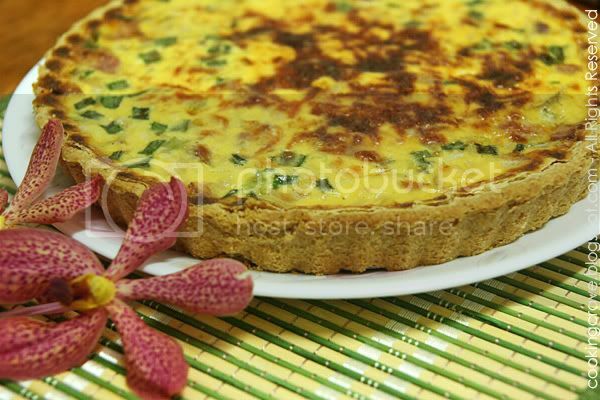 I first got to know this "Quiche" from my friend Wendy's Blog and I never tried this before. 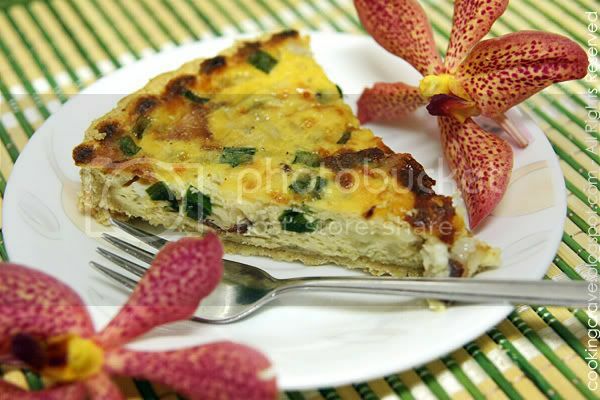 Quiche (pronounce as "keesh") is an open savoury tart with the fillings made from eggs, milk, cheese, meat (bacon) or vegetables (spinach, tomatoes)..etc, just add in any ingredients of your liking. I made this Quiche for our dinner yesterday. It is a French cuisine that usually served for breakfast, lunch or as snack for teatime or picnic. 1. Sieve the flour and salt into a mixing bowl. 2. Rub in the butter and margarine until the mixture resembles coarse breadcrumbs. 4. Shape it into a ball, wrap in cling wrap and refrigerate for about 20mins. 5. After 20mins emoved the chilled dough from fridge, let it soften slightly at room temperature. 6. Roll the dough into a 3mm thick piece, it has to be 50mm larger round than tart pan. 7. Transfer to a 8" tart pan and trim. 8. Prick the face all over with the fork. 10. Cover crust with aluminum foil and freeze for 1 hour before use. 2. Fried the bacon slices until crspy in the non-stick pan without oil - crumble and set aside. 3. Saute the onion with olive oil until fragrant, stir in the crumbled bacon and green onion. Remove from heat and set aside. 4. Whisk together the eggs and egg whites together. Then add in evaporated milk, low fat milk, cornstarch, black pepper, salt, nutmeg. Whisk till well combine. 5. Mix grated cheese into cooled onion bacon mixture, then spoon the mixture into the crust. 6. Slowly pour the egg mixture in even layers. Make sure all the cheese are cover by the milk mixture to avoid the brownish/burnt top when baking. Mix the grated cheese with bacon onion before pour the milk mixture on top of it and not sprinkle the grated cheese after we pour in the milk mixture.